I made my first Gas Truck hater....... a "cranky" neighbor tonight. Mind you this guy is ALWAYS complaining about the noise from the tavern and just about anythign else in the world...... but Granted it WAS 12 am, and I was in a parking lot about 800 paces away from his house, and behind a row of dense trees, I still managed to upset him. Loud, yeah, I guess. Inconsiderate ? a tad. But I wanted to run the truck, and It was only 10 minutes or so..... it wasn't THAT loud since there is a nightclub next to where I was and the motorcycles pulling in and out all night long are far more annoying than me for a 1/4 hour......... But allas..... He did have a point, and I shut down immediately and apologised. So in short, how can we "quiet" our beast and still get away with running them? RE: SILENCERS ? Big and quiet possible ? Nice one dave! About a month ago was on the drink working in a country town, bout 2am - pissed to the eyeballs slipped thru a busted fence and got a mate's baja crankin in a mcdonalds carpark next to motel in the middle of town, bloke came out from store on phone (probably mcmanager) and all lights went on in motel rooms, grabbed mcbaja and mcran. 5 mins later 2 of the towns finest officers drop into see whats going on - we were lights out watchin from our room giggling like girls. Midnight Run, nice. I have a V3 w/silencer on my Baja. With the silencer on, it a little louder than stock not much a little. I think you can also put a peice of exhaust tubing on the end of the stinger, the longer the quieter. I have not been able to run the truck for almost a month as it has been in pieces and I got teh last few parts today when I got home from work around 10:00 pm. The itch was just too great and well... the fever..... Cat had to scratch...... LOL. Usualy I run around 10:30 or so and have not had any problems with noise that I know of. There is another parking lot across the road and is more secluded as a "comercial" area. I may go run there instead. I'll just have to ask the property managers. One potential issue I can see with using any kind of silencers is more backpressure and perhaps carbon fouling. Going to have to look into this seriously as I really do like drivng it at night in the wide open parking lot under the lights. I'm with you Dave. I don't complain about my neighbors making noise, and I'm not a Harley hater, but if they can get away with those loud pipes then I should be able too as well. And I don't see how a silencer could work without reducing performance. Thats true, you'll have to sacrifice some power for a little quiet running. midnight .. damn buddy if i had to work the next day i wouldnt be a happy camper either .. the difference from a street bike and our toys is the bikes dont stay around its a few seconds of noise but our pipes scream in one place and i can see that guy getting bent outta shape at midnight . I dont mind other peoples noise because I sleep deeply and it just doesnt bother me, it but I can see how can really ruin your night if you literally cant sleep at all. From time to time I take the Baja to our house in Santa Cruz, on the beach. There I run it at midnight under moonlight, its too great. Well, I'm willing to sacrifice some power. I was weedwacking at a jobsite for some community service, and they had a TORO string trimmer that had a very quiet exhaust box on it. Even at full Rev, it was not super loud. Perhaps this is the answer ? I'm going to call GRASSLAND tomorrow and see if they have any suggestions how to get quieter. I was running at 8:30 pm on my day off on Sunday, and "customers" walking out in the parking lot were "complaining" to the store front end about the "noise". A "represenative" * Named LATISHA came out and up to me and said that some people were complaining about it being too loud. As she was saying this, some Motorcycles speed off at the green light and I say " what ? WHATTTT? WAHHTTT?? I CAN'T HEAR YOU... THE TRAFFIC IS TOO LOUD......" .... I laughed as did 3 people who were talking with me, as the traffic settled down a bit, and I said to her " Is a moot point made really worthwhile" ? she laughed, and said "word...... no doubt". and waddled off back into the store. I ran around for another 15 min, then went back home. Not sure what ya mean, link? 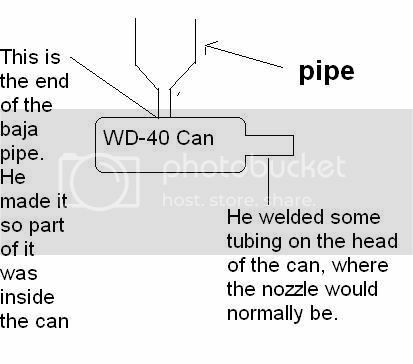 Dave, some guy had the brilliant idea of converting a used WD-40 spray can into a silencer. It worked pretty well. Mind you, he did it for the HPI pipe, so if you did it, you'd have to fashion it differently. I'll try doing a drawing with paint. The weedwackers might have been one of the newer model 4 strokes. I have a Stihl 4 stroke weedwacker, sucker has serious torque. At full throttle its very quiet. DDM has some extension tubing for the stingers (like what TheFgMan is talking about). Thats what I recommended in my first post. screw a power loss.. LOUD and wide open all day long!! Thats what I'm talkin about. What pipe are you running ? if its a JP ,call Sean up @ oniels and grab a silencer or if its a DDM pipe then do what baja5b said and add some silencer wadding from a bike shop and stuff the can .. I'm running the big baddass Jetpro pipe. With a good designed muffler you won't loose any power, you might even gain some top end RPM as backpressure increases!